Canandaigua, NY USA: Auto dealers have effectively used key storage boxes hung from car windows or parking posts to simplify key management and ease of access for test drives. With the advent of Remote Keyless Entry (RKE) systems that utilize proximity key fobs, this type of key can cause unintended access when stored near vehicles. Select Fabricators, Inc. of Canandaigua, NY USA has developed the RKE Key Fob Pouch that fits easily into most auto dealer’s existing key storage boxes preventing remote entry key fobs from unlocking cars. Made of highly conductive materials, RKE Key Fob Pouches block signals from exiting or entering the pouch. Easy to use, these flexible pouches slip easily into key storage boxes, and work with most automobile manufacturers’ remote entry key fobs of varying sizes and shapes. Auto dealers who have invested in these key storage boxes can now continue to effectively use this key management system. RKE Key Fob Pouches replace the two-part metal inserts that can bend and be difficult to fit into a key storage box. 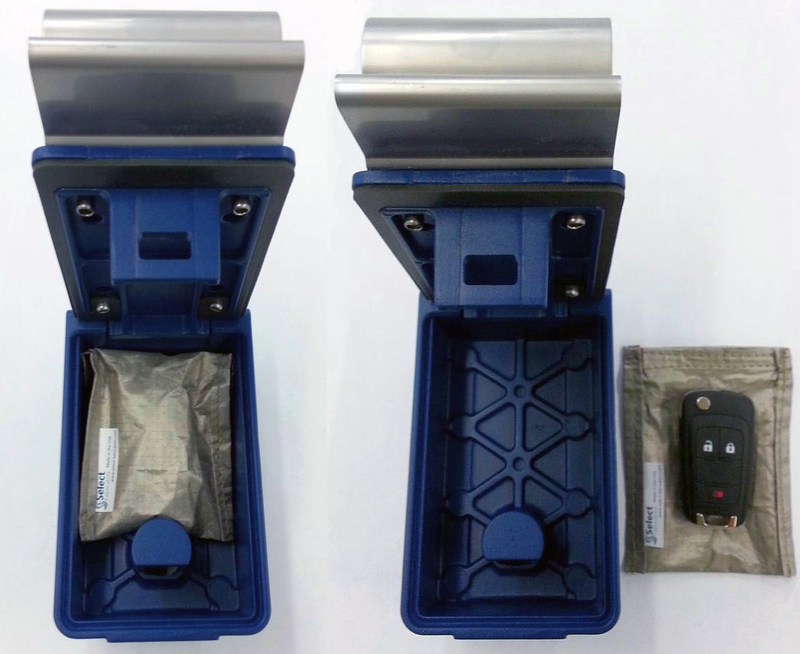 Select Fabricators’ RKE Key Fob Pouches work with key storage boxes including Supra’s KeyAdvantage®, Indigo, Max and Magnum systems, as well as other key management boxes*. Made in the USA, Select’s RKE Key Fob Pouches are made of Nova Select™ conductive silver/copper/ nickel RoHS compliant fabric. The RKE RF isolation system is achieved by securing the opening with an integral hook and loop closure system. The highly conductive fabric is also used by Homeland Security and Defense agencies for secure communications. This metal-coated rip-stop nylon material is highly secure and very durable. RKE Key Fob Pouches have a customizing option of a company’s name and/or logo label which can be given to customers to enhance proximity key fob security. Founded in 2000, Select Fabricators, Inc. is the premier US manufacturer of portable, collapsible fabric RF shielding solutions including signal reduction enclosures, tents, pouches, and curtains custom engineered to our clients’ requirements for stealth and security, product testing, forensics and a variety of other RF shielding applications. With capabilities in industrial sewing, film, and laminate converting, heat sealing, ultrasonic welding, pad printing, die-cutting and cleanroom secondary operations, SELECT delivers a wide array of solutions to the aerospace, forensics, homeland security, law enforcement, industrial, medical, military and wireless communications industries. Shield. Seal. Assemble. Cover. Comply. References: * Supra and its KeyAdvantage®, Indigo, Max and Magnum Systems are trademarks of the respective company and do not imply endorsement of Select Fabricators, Inc. or any of its products.